Summer’s burn was starting to wane as the early days of Autumn begin to embrace the city. On this Sunday, in the early hours of dawn, a job was going down. A large sum of laundered money was in the trunk of a car and waiting at Union Station. The only clue that Cardone had was it was in a sedan. Sundays at a train station are interesting. Sparse. In the underworld, this is a safe way to make transactions. Cardone walked into the station and took note of those around him. A hobo asleep in the corner. The ticket taker sat reading the Sunday Times. A soldier with a letter in his hands. He looked anxious. Cardone’s guess was the kid was headed off to basics, then off to whatever killing field we send our youth off to now days. Not a security guard or person who would raise his shackles and call the deal off. He reached into his lapel and withdrew his cigarette case. Pulled a Lucky from inside and lit up with his Zippo. He inhaled and walked toward the parking lot. It was 7:30. The good people of the city were attending their church of choice or just waking. He descended the concrete stairs and walked with a purpose his Oxford wingtips crunched and scuffed across the baked asphalt. The cop that they had put the screws to had been informed that if he did not comply, that, well, his story would be spilled and besides losing his job, his life was on the line. His name was Eugene Falks. He was a tall and lanky man. Just looking at him one could see that he was raised by an oppressive mother who pressured this poor guy to fear everything. Even his own shadow. Easy target. It started casual. Falks was such an easy target. No friends. Living in his Mother’s house. Virgin. In this age of whatever the world is becoming. Regardless, it took a matter of weeks for them to wrangle him for 500k. Right from the metro’s own account. Cold hard cash too. So here he was in the midst of the parking lot and saw it. White on white. A fresh ’64 Plymouth Belvedere sedan. Keys in the ignition. But Cardone paused. It seemed to easy. He reached in and snagged the keys from the ignition. Stood upright and took in the surroundings. No wind. Not a sound. The murmur of traffic building as the sun ascended the skies on this crisp Sunday morning. He took the final drag off of his cigarette and walked to the back of the Belvedere. He inserted the key and with a twist of the wrist it popped crisply. Cardone glanced up and saw the huge locomotive leaving the station. 8 A.M. Time is close. Soon the beat cops would be looking for things that, well, they have no business looking for. Carbone lifts the trunk and looks down and in the back-ground he hears an engine fire. Two large Samsonite suitcases are there. He clenches his fists and his knuckles crack in order. All apart of his routine. A grin cracks his face and he reaches downward and to his left an Edsel eases out from a parking space. 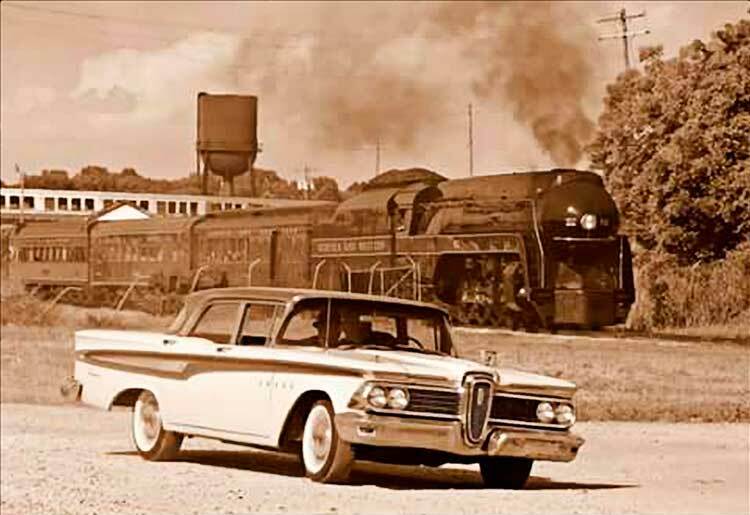 The massive locomotive is gaining speed as is the Edsel. He hits the latch release on the Samsonite and it splits open. Carbone raises his gaze from the trunk of the Plymouth. The Edsel is gaining ground and the sun rises as the city is now awake. Over the railway crossing Eugene dashes. The Dawn Express lets go with another shout and then separates Carbone from the access road. And it hits. A stolen car filled with sawdust. His hands start to shake. It all seemed so easy.